Oh, yes, the 20 free cards available is a great incentive to try out ABC Bingo, but of course they have to keep the good times going so there is much more in store. I particularly like playing the slots and on the opening page I see lots of slots I'd love to be playing. Monopoly, Wheel of Fortune, Cubis, Hole in the Wall, and Sale of the Century are just a few of the newest games on site. But if you love to just play bingo you are also in for a happy time at ABC Bingo. You'll see various versions of 90 ball, 75 ball and High 5 bingo at this site, and all are quite fun to play. Don't miss out on trying for the progressive jackpot games because you can hit a really swell bingo with just one lucky card. 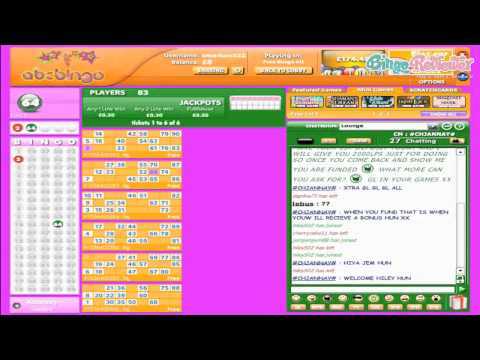 Try out team bingo or play other games on site like scratchcards, and don't forget the chat games with fun ways to win tons of bbs and play more at ABC Bingo. Hope you have lots of luck at this site. Registration here is super easy. There is no doubt about that. They will generously match your first deposit by 100%, starting you off with a great gaming experience. It’s best to make your first deposit a big one! They have a standard set of gaming options available here. They have three types of bingo, including 75 and 90 ball as well as high five bingo. I think high five bingo is a nice addition to any site because you don’t always see it everywhere. They don’t have a bad selection of slots either. Their great jackpots really make the games worthwhile! You can’t go wrong with the promotions they have here. They have tons of free bingo available here. In fact, players can access it every single day. There are free games offered to both funded and non-funded players. They also have exciting happy hour bonuses and zodiac bingo which is always a blast! ABC is a one of the classic bingo sites (in the good way), with decent bonuses, nice games, great community and nice payout. No matter if you are a newbie or a seasoned bingo player, this is one of the stops you don't want to miss. There is no regular no deposit bonus, but there are 20 bingo cards you get for free to play, that you can use to play cash games, just remember that in order to cash in your winnings, you have to make a deposit. Do keep in mind that the minimum deposit is £10, and the tickets cost from 1p to £1. As they use Dragonfish software, you can play 75, 90 ball and High 5 Bingo, which is default for DF. I prefer High 5 which is really fast paced and quite interesting. you can also find some Slots, but also Progressive Jackpots and Team Bingo games, so a little bit of something for everyone.